If you had to think of the number one cluttered room in your home, which would it be? Most would say a spare bedroom, an office, or a den. Did you know that more than 50 percent of homeowners in the US say their garages are the most disorganized and cluttered space in their entire home? What’s more, most homeowners aren’t aware that their garages are disorganized until someone points it out. They think it’s normal to have belongings piled high. If this sounds like you, it’s time you considered garage storage and organization for your San Francisco home. 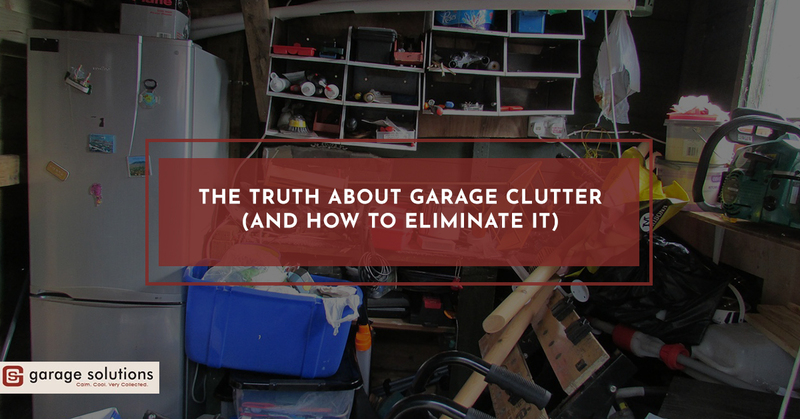 In this post, we’re going to help you identify the main cause of your clutter, and then give you five reasons why your garage is disorganized in the first place. Ready to take the next step toward reclaiming your garage? Give Garage Solutions a call today. In the meantime, read this post to learn more. First, you want to recognize why your garage is cluttered. Is it boxes, garden equipment, random items you didn’t have anywhere else to store? The goal here is to identify what’s not being stored and why. Do you have space for it? Are you lazy? Not sure how to store some awkwardly shaped items? The reasons are endless; however, if you can find three or four types of clutter in your garage and organize it as such, you can begin to understand what type of home garage storage system you will need to design and install. Not everyone is attuned to organization. That’s not a bad thing. It simply means you don’t naturally organize things, and, in some cases, you don’t really care. Nonetheless, the slow creep of clutter upward toward your garage ceiling is obviously bothering you now, or you wouldn’t be searching for answers. This is simply one reason you haven’t installed a garage storage solution just yet. At Garage Solutions, we understand. You’ve got a lot of stuff. It will take a lot of time to pull all of it out of the garage, filter it on the front driveway, and return it all back inside; however, with a home garage storage system you only have to do that once. Once your garage storage and cabinets are installed, you’ll never have to hassle with clutter again. Imagine the time and money you’ll save. If you treat your garage like a catch-all, then you may not be ready to organize it just yet. But what if you could install a garage system that allows you to keep your garage as the main storage point in your home, but without losing your mind weeks or months later trying to find something? It is possible to achieve multiple homeowner goals with one purchase, a home garage storage system. This is a common problem around San Francisco and the greater Bay Area. Space is at a premium, and unless you have a larger home, you’re limited. Fortunately, a storage system actually gives you more room to have more things, even though you have cabinets, wall slats, and more to store things. The challenge with small garages is not how do I get rid of everything, but how do I store everything? Depending on the season, you may have different levels of clutter. You could pull garden equipment in from the shed during spring and summer, storing garden equipment in lieu of winter equipment. What kind of sports do your children play? It all plays a part in how disorganized your garage could get. There is a solution: garage storage and organization. Get rid of outdated/unused items. When you clean out your garage, you will effectively reduce clutter. Consider getting rid of any items or belongings you haven’t used in the last six to 12 months. Install a storage system. This option is easy when you call Garage Solutions. We offer custom cabinets, unique wall storage systems, and more! Add a car rack. In some cases, you may want to store more than one car in your garage. Install a car rack, if you have the headroom, to keep one-half the garage free for other activities. Ready to organize your garage? Call Garage Solutions today!